Although it is one of the most universally recognized of the numerous monuments and memorials located within the hallowed grounds of Arlington National Cemetery (MAP), the memorial I rode there to see on this lunchtime bike ride does not have an official name. 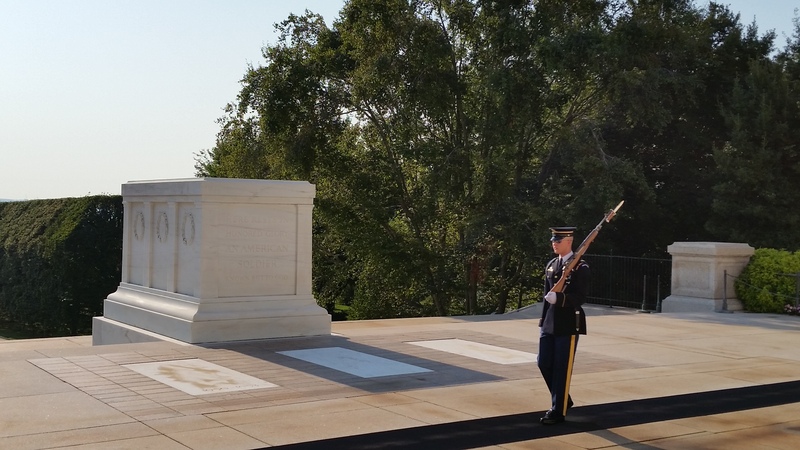 It is most commonly referred to as either the Tomb of the Unknowns, or the Tomb of the Unknown Soldier, but it has never been officially named. In March of 1921 the United States Congress approved the burial of the unidentified American soldier in the plaza of the new Memorial Amphitheater in Arlington National Cemetery. So an unknown soldier was exhumed from an American military cemetery in France, and transported back to the United States, where he laid in state in the Capitol Rotunda until Armistice Day of that year. Then, in a ceremony presided over by President Warren G. Harding on November 11, 1921, the unknown soldier was laid to rest and the Tomb of the Unknowns was dedicated as a monument to all those who had fallen during World War I. Over the years the monument has changed a number of times in regard to both its appearance and purpose. In July of 1926, five years after its dedication, Congress authorized and appropriated money for the completion of a superstructure on top of the Tomb. A design competition was held and won by architect Lorimer Rich and sculptor Thomas Hudson Jones. The Tomb was completed without formal ceremony in April of 1932. But the biggest change to the Tomb took place in August of 1956, when President Dwight D. Eisenhower signed a bill to select and pay tribute to the unknown soldiers of World War II and the Korean War. Finally, on Memorial Day in 1984, President Ronald Reagan presided over the internment of an unknown soldier from the Vietnam War. Interestingly, with subsequent improvements in DNA testing, the remains of the unknown from the Vietnam War were identified as those of Air Force Lieutenant Michael Joseph Blassie, who was shot down near An Lộc, Vietnam, in 1972. The identification was announced in June of 1998. The following month, Blassie’s remains were sent home to his family in St. Louis, Missouri, where he was reinterred at Jefferson Barracks National Cemetery. Today, the slab over the crypt that once held the remains of the Vietnam Unknown has been replaced. The original inscription of “Vietnam” and the dates of the conflict has been changed to “Honoring and Keeping Faith with America’s Missing Servicemen” as a reminder of the commitment of the Armed Forces to the fullest possible accounting of missing service members. 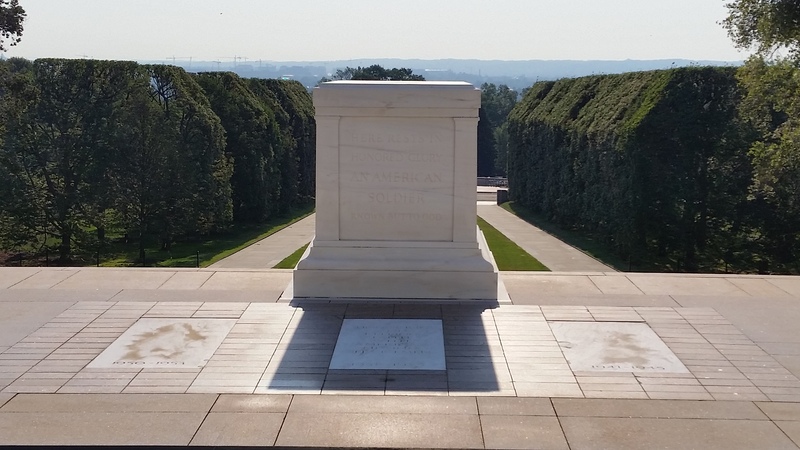 One of the most distinctive and unique features of the Tomb of the Unknowns is that it is guarded 24 hours a day, 7 days a week, in any and all kinds of weather. In fact, there has been a Sentinel, as the guards are known, on duty in front of the Tomb every minute of every day since 1937. Sentinels, all of whom are volunteers, are considered to be the best of the elite 3rd U.S. Infantry Regiment, the oldest active-duty infantry unit in the U.S. Army. 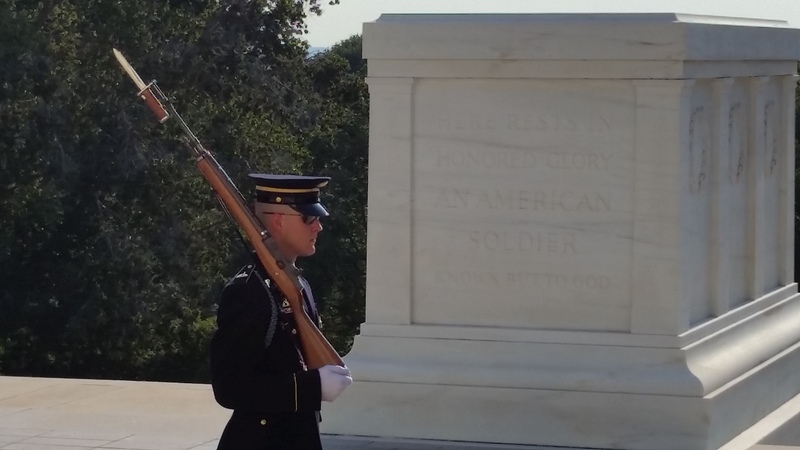 Also known as The Old Guard, the Sentinels are headquartered at nearby Fort Myer, which is adjacent to the cemetery. 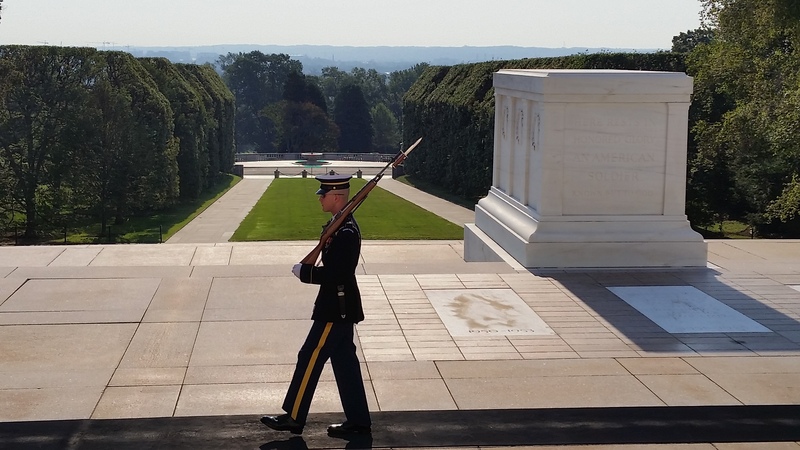 It is considered one of the highest honors to serve as a Sentinel at the Tomb of the Unknowns. 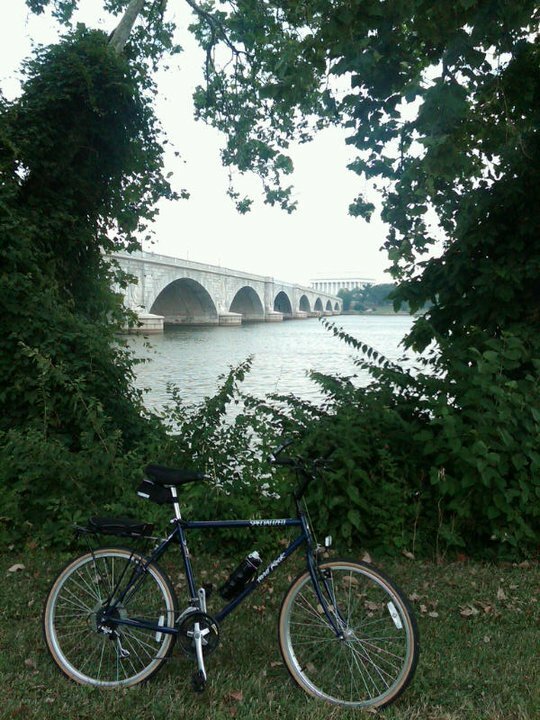 During a portion of this two-wheeled outing I rode up and down Constitution Avenue, which is a major east-west street located on the north side of the National Mall, running parallel to Independence Avenue on the Mall’s south side. Constitution Avenue spans the northwest and northeast quadrants of D.C., with its western half extending from the U.S. Capitol Building to the Theodore Roosevelt Bridge. Its eastern half continues through the neighborhoods of Capitol Hill and Kingman Park before it eventually terminates at Robert F. Kennedy Memorial Stadium. 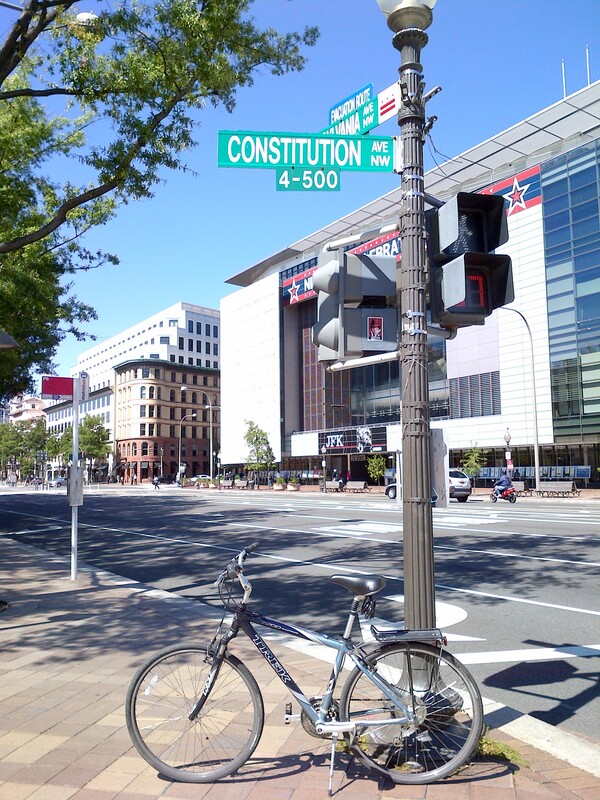 Constitution Avenue was not always known by its current name, however. And had it not been for a traffic jam, it might still be known today by the name it had under the structured naming convention of the city’s original architectural plan developed by Pierre Charles L’Enfant. That name was B Street. Back in November of 1921, President Warren G. Harding was travelling to the dedication ceremony for the Tomb of the Unknown Soldier at Arlington National Cemetery when he was caught in a three-hour traffic jam which resulted from the inability of the existing bridges at the time to handle traffic. Resolving to prevent that from happening again, President Harding sought an appropriation to fund the work to design and build a more adequate bridge. Congress subsequently approved his request in June of the following year, which would eventually result in the construction of Arlington Memorial Bridge. However, B Street was a smaller, narrower street at the time, and extensive widening and reconstruction was needed to accommodate the traffic. Eventually, after years of planning, the vision for B Street had expanded for it to be a ceremonial gateway into the national capitol city from the magnificent new bridge, as well as one of the city’s great parade avenues, similar to Pennsylvania Avenue. And as the nature of the B Street project became apparent, there were calls to rename the street. But nothing is ever easy in D.C., and renaming B Street was no different. In early 1930, legislation was introduced in the House of Representatives to rename the street L’Enfant Avenue. City officials opposed the name, however, advocating instead for Lincoln or Washington Avenue. Congressman Henry Allen Cooper then introduced legislation to rename the street Constitution Avenue. The proposal met with strong support from city officials, but was rejected by the House of Representatives. The bill was resubmitted the following year. During discussion on the floor of the Senate, it was suggested that the street be named Jefferson Avenue in honor of President Thomas Jefferson. Representative Cooper opined that the name Constitution Avenue in a way paid tribute to our third President as the author of the Constitution, and that a national presidential memorial to President Jefferson should be built. By the end of the decade, President Franklin D. Roosevelt laid the cornerstone of The Thomas Jefferson Memorial. This time the legislation renaming B Street passed both the House and Senate before being signed into law by President Herbert Hoover in February of 1931, and it has been known as Constitution Avenue ever since. On this day in 1933, the 21st Amendment to the Constitution was ratified, repealing the 18th Amendment and bringing an end to the era of national prohibition of alcohol in the U.S. It should be noted that the consumption of alcohol was never illegal under federal law. Prohibition focused on the manufacture, transportation, and sale of alcoholic beverages. However, exceptions were made for medicinal and religious uses. Nationwide prohibition did not begin until 1920, when the 18th Amendment to the Constitution went into effect. Thirteen years later, what President Woodrow Wilson referred to as “America’s noble experiment” ended. The movement for the interdiction of alcohol that eventually resulted in Prohibition actually started much earlier – in the early 19th century, when Americans concerned about the adverse effects of drinking began forming temperance societies. By the late part of the century, these groups had become a powerful political force, campaigning on the state level and calling for national liquor abstinence. The Anti-Saloon League was one of the most prominent of these organizations, and eventually spearheaded the lobbying for prohibition in this country. 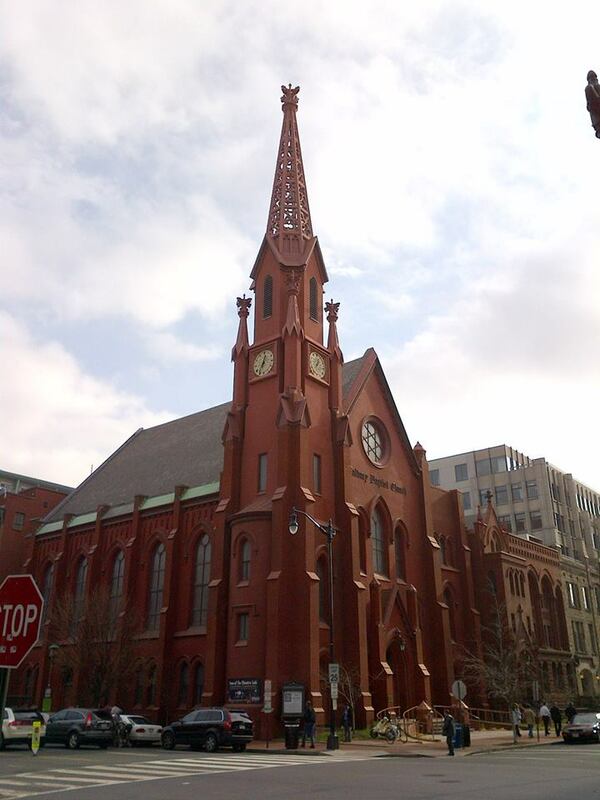 Calvary Baptist Church, a bright red brick church located at 755 8th Street (MAP) in northwest D.C.’s Penn Quarter neighborhood, is where the first Anti-Saloon League meeting was held. It was also one of my destinations on today’s lunchtime bike ride. 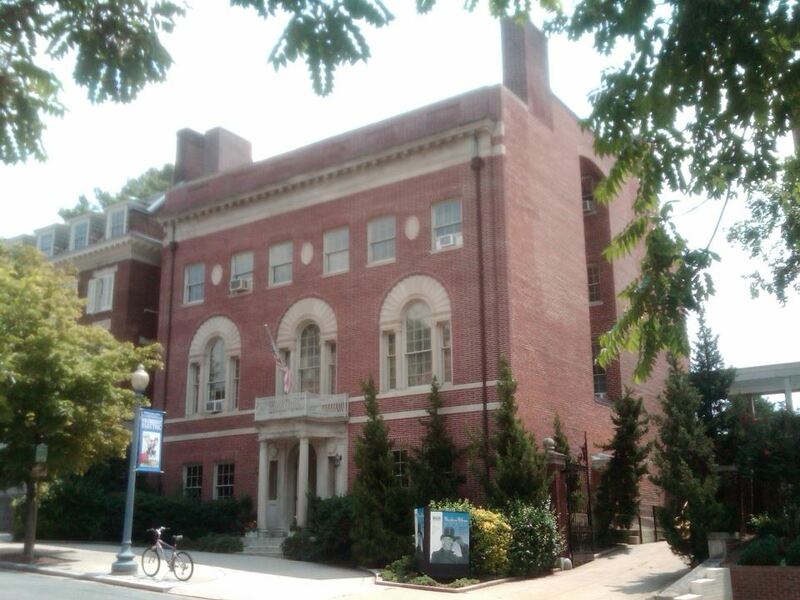 On this ride I also went by a couple of other D.C. locations with connections to Prohibition – The Woodrow Wilson House and D.C.’s Temperance Fountain – despite the fact that I have been to and written in this blog about these locations previously. 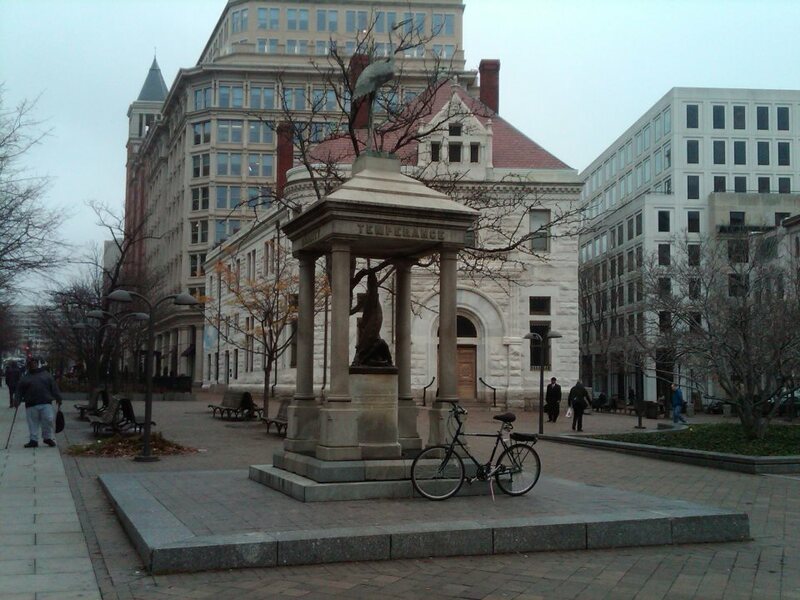 My last destination for this prohibition-themed bike ride was the Temperance Fountain, located at the corner of Seventh Street and Indiana Avenue in downtown D.C. (MAP). A temperance fountain was a fountain that was set up, usually by a private benefactor, to encourage people not to drink alcohol by providing safe and free water instead. During the earlier temperance movement, beer was the main alternative to water, and generally safer. The temperance societies had no real alternative as tea and coffee were too expensive, so water fountains were very attractive. One such fountain still exists in D.C. It was one of the ones built by Henry Cogswell, a dentist and a crusader in the temperance movement. It was his dream to construct one temperance fountain for every 100 saloons in the U.S. It is unknown exactly how many Cogswell actually built, but the fountain in D.C. is one of only four that still remain. After the repeal of the 18th Amendment in 1933, some states continued Prohibition by maintaining statewide temperance laws. Mississippi, the last “dry” state, didn’t end Prohibition until 1966. To this day there continue to be areas within states where prohibition remains in effect, commonly referred to as “dry counties.” There are currently more than 500 counties and municipalities in the U.S. that are dry, including 83 in Alaska. Nearly one half of Mississippi’s counties are dry. And in Florida, four of its 67 counties are dry, all of which are located in the northern part of the state, an area that has cultural ties to the Deep South. And although Moore County, Tennessee, is the home of Jack Daniel’s, a major operational distillery of whiskey, it is also a dry county, so the product is not available at stores or restaurants within the county. By comparison, D.C. is not dry, and it is very different place today than it was when the Anti-Saloon League was meeting at Calvary Baptist Church and people were drinking water from the Temperance Fountain. There are currently over 1,900 establishments and businesses that possess liquor licenses to sell alcohol to the 646,449 residents in the 68-square-mile area known as the District of Columbia. 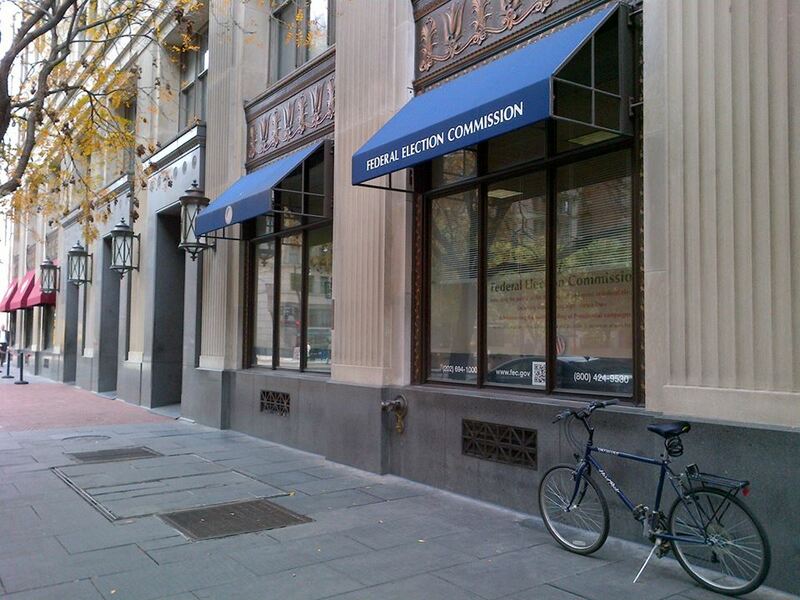 This works out to a bar or liquor store for every 340 residents of our nation’s capitol. Election Day in the United States is the day set by law for general elections, and occurs on the day after the first Monday in November. (Note that the “day after the first Monday” does not equal the “first Tuesday” in a month when the first day of the month is a Tuesday.) The earliest possible date is November 2nd and the latest possible date is November 8th. 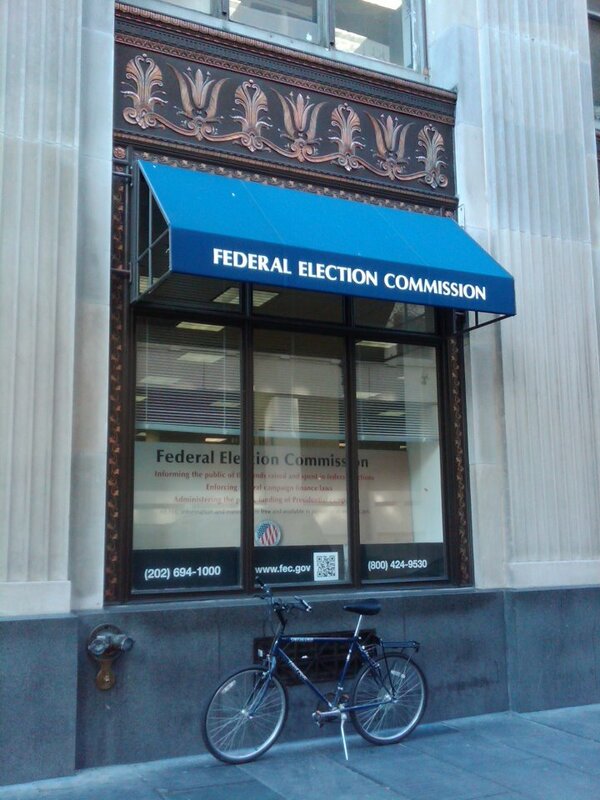 On this bike ride, in recognition of today being Election Day, I stopped by the headquarters for the Federal Election Commission. 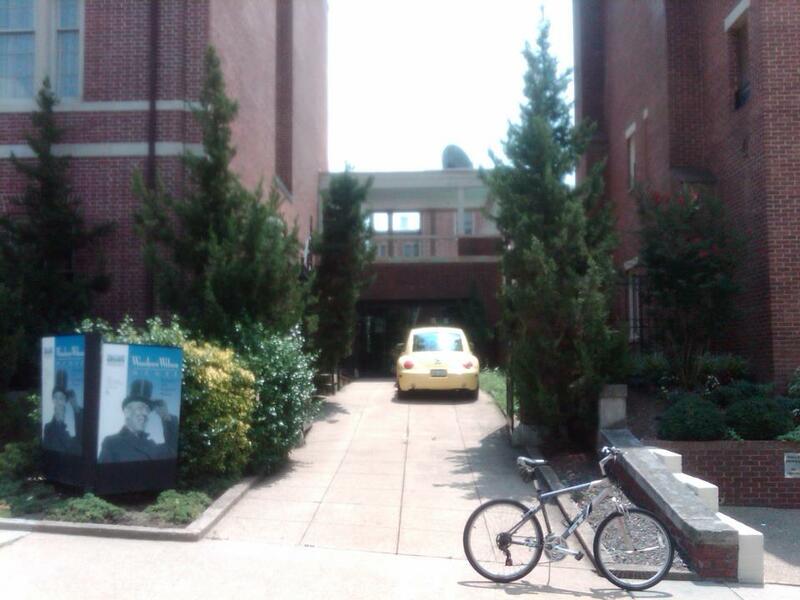 It is located at 999 E Street (MAP), across from FBI Headquarters and next door to the Hard Rock Café in northwest D.C. Historically, when an election day for a Presidential election falls on today’s date, November 4th, it was generally very good for Republicans throughout the 20th century. The streak began when Election Day fell on November 4th back in 1924, and Calvin Coolidge was elected to the country’s top office. Coolidge was already in the office of President, having to complete the term of Warren G. Harding, who died while in office. This time, and on this day, he was voted into office by the people of the U.S., and served another four years. History repeated itself in 1952 when Dwight D. Eisenhower was running against Democrat Adlai Stevenson. Once again, Election Day was on November 4, and “Ike” won. It was the first Republican presidential victory in 24 years. Eisenhower became the 34th U.S. President. When Election Day fell on November 4th again in1980, it was a good year for Republicans all around. Most of those Republicans running for seats in the U.S. Senate were victors, winning a majority of the seats. And in a landslide, Ronald Reagan won the race for President against the Democrat incumbent, Jimmy Carter. Before 1924, it was a different story: Democrat Grover Cleveland made it to the top in 1884; and Democrat James Buchanan was elected President of the U.S. on November 4, 1856. Unfortunately, the Republican victory streak did not continue into this century either. It ended five years ago today, on November 4, 2008, in the first presidential election held on November 4 in the 21st century. In that election, Democrat Barack Obama was elected President. The next November 4 Presidential election will be in 2036. However, there is not a presidential election this year. The general elections being held today are considered “mid-term elections.” These elections include all 435 seats in the U.S. House of Representatives and 33 of the 100 seats in the U.S. Senate; along with the governorships of 36 of the 50 states and three U.S. territories, 46 state legislatures (except Louisiana, Mississippi, New Jersey and Virginia), four territorial legislatures, and numerous state and local races. Voter turnout in national elections varies in countries throughout the world. In Belgium, which has compulsory voting, and Malta, which does not, participation reaches 95 percent. 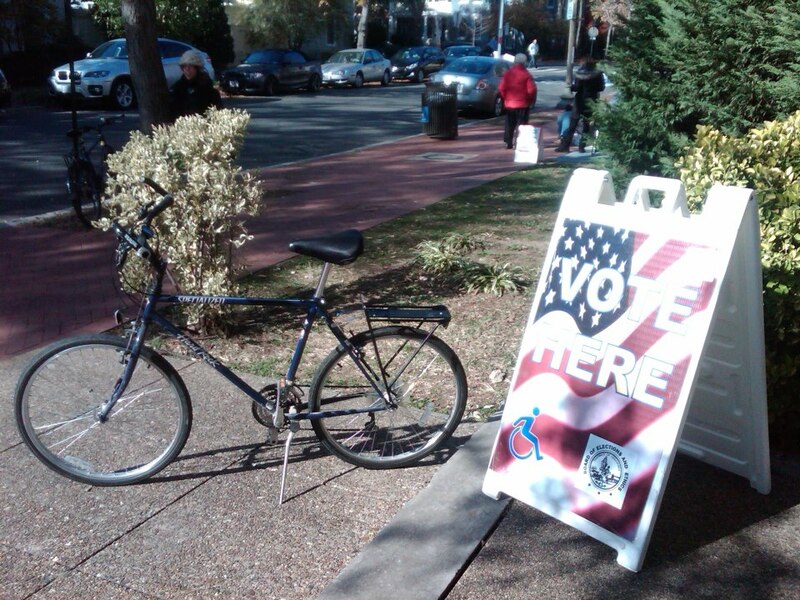 Voter turnout in this country averages only 48 percent. And voter turnout in this country decreases for midterm elections. Only 39.9 percent of eligible voters cast a ballot during the last mid-term elections, and estimates indicate voter turnout could be even lower this time around. So if the predictions are correct, more than 6 out of 10 eligible voters will not participate in today’s elections. That makes each vote even more important. So make sure you vote early. And as is the tradition if you’re in Chicago, vote often. 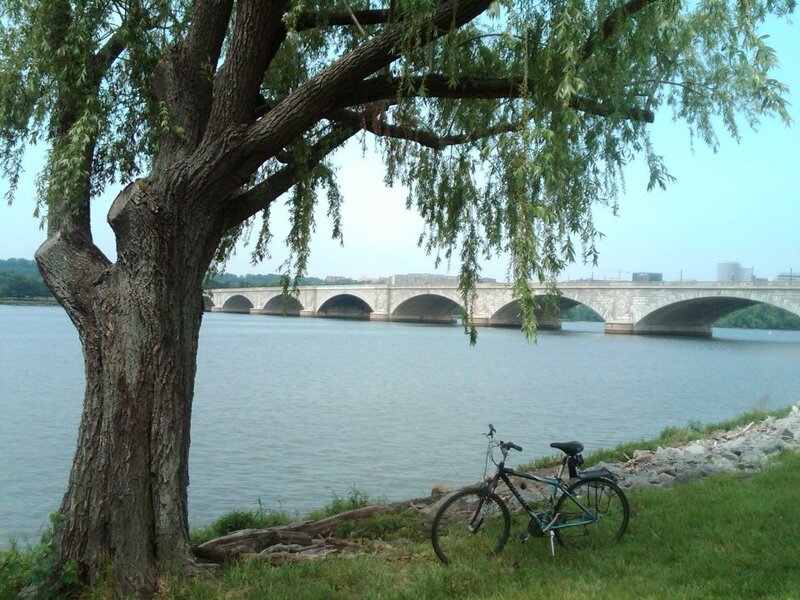 Widely regarded as D.C.’s most beautiful bridge, Arlington Memorial Bridge spans the Potomac River and is one of nine bridges that connect the National Capital City to the Commonwealth of Virginia. It is located at the western end of the National Mall (MAP), and in part constitutes a formal terminus of the Mall. 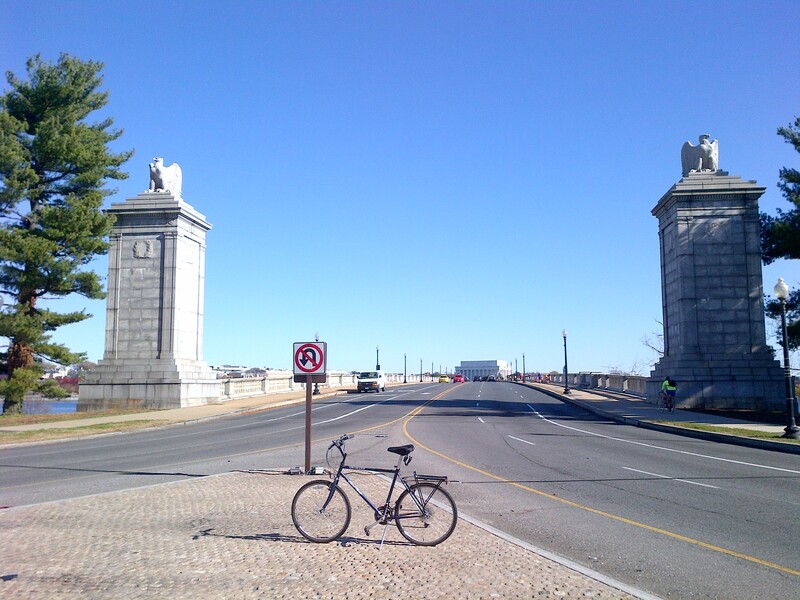 A masonry, steel, and stone arch bridge with a central drawbridge, Arlington Memorial Bridge was designed in the Neoclassical architectural style. Except for the draw span, the bridge is of reinforced concrete construction faced with dressed North Carolina granite ashlar. The draw span is of the double leaf, underneath counterweight type and is faced with pressed ornamental steel made to blend with the masonry spans. At the time it was built, the draw span was the longest, heaviest and fastest in the world, although it is now sealed and inoperative. The bridge is 2,163 feet long, carrying a 60-foot-wide roadway and 15-foot sidewalks on either side. Arlington Memorial Bridge also contains some ornamental characteristics typical of the “City Beautiful Movement” which was taking place in D.C. at the time it was designed. This reform philosophy of North American architecture and urban planning flourished during the 1890s and 1900s with the intent of introducing beautification and monumental grandeur in cities. However, it promoted beauty not only for its own sake, but also to instill moral and civic virtue among urban populations. The northeastern entrance to the Arlington Memorial Bridge features “The Arts of War” sculptures, Sacrifice and Valor, which were completed by Leo Friedlander in 1951. On the pylons of each pier of the bridge are large circular discs with eagles and fasces designed by sculptor Carl Paul Jennewein. Congress first proposed a bridge at the site of the current structure on May 24, 1886. However, the bridge went unbuilt for decades thanks to political quarrels over whether the bridge should be a memorial, and to whom or what. Then in November of 1921, President Warren G. Harding was travelling to the dedication ceremony for the Tomb of the Unknown Soldier at Arlington National Cemetery when he was caught in a three-hour traffic jam because the existing bridges at the time could not handle the traffic. Resolving to prevent that from happening again, President Harding sought an appropriation to fund the work to build a bridge. Congress subsequently approved his request in June of the following year. Construction finally began in 1927, and took six more years to complete. The dedication ceremony was on January 16, 1932, headed by President Herbert Hoover. 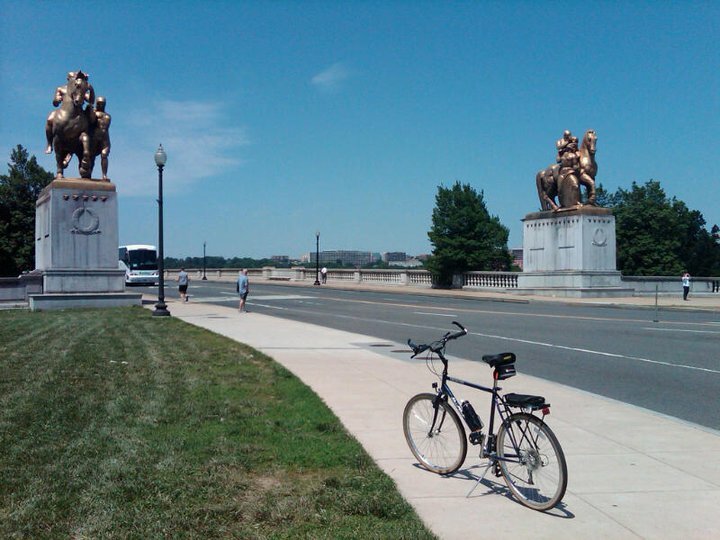 Arlington Memorial Bridge was added to the National Register of Historic Places in 1980. Dante Alighieri is a public artwork by an Italian sculptor named Ettore Ximenes, and is a tribute to the major Italian poet of the Middle Ages of the same name, mononymously referred to as Dante. It rests on a granite base, with the statue depicting a standing Dante wearing a robe and a laurel wreath on his head. In his hands he is holding a copy of “The Divine Comedy,” his epic poetic trilogy depicting an imaginative and allegorical vision of the afterlife describes Dante’s journey through Hell (Inferno), Purgatory (Purgatorio), and Paradise (Paradiso). Originally called Commedia and later called Divina by Giovanni Boccaccio, who wrote a biography of Dante. The Divine Comedy is widely considered the preeminent work of Italian literature, as well as one of the greatest masterpieces of world literature. Dante was a Medieval Italian poet, writer, political thinker and moral philosopher. He known in In Italy as il Sommo Poeta, or “the Supreme Poet.” He is also called the “Father of the Italian language.” He was born in Florence in the year 1265. Unfortunately, relatively little is known about his life. Much of what is known of the writer comes from his essays and writings. Dante did not write of his family or marriage, but it is known that he married Gemma di Manetto Donati, and they had several children, of whom two sons, Jacopo and Pietro, and a daughter, Antonia, are known. Dante Alighieri is a casting of an identical statue located at Dante Park in New York City, and was donated to the city of D.C. as a “gift of the Italians of the United States” by Carlo Barsotti, the founder of Dante Park and editor of Il Progresso Italiano-Americano, an Italian-language daily newspaper published in the United States at that time. 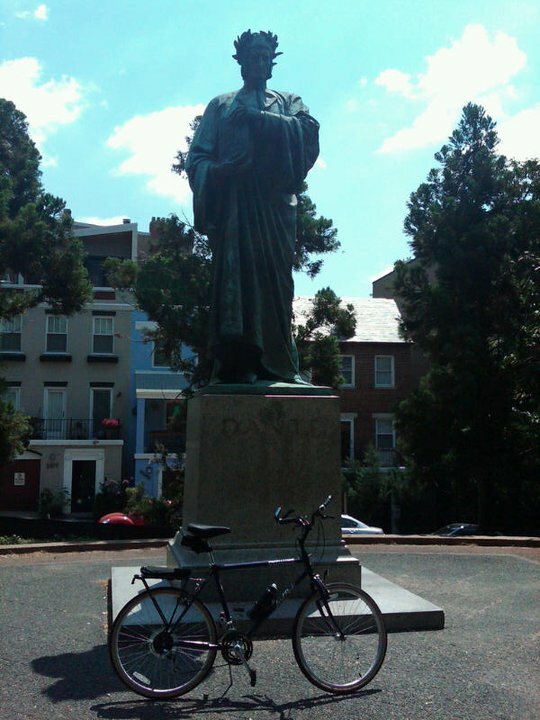 On this bike ride, I rode to see the statue, which is located at the southeast corner of Meridian Hill Park, which is located in northwest D.C.’s Columbia Heights neighborhood, on land bordered by 15th, 16th, W, and Euclid Streets (MAP). It was dedicated at that location in December of 1921, in a ceremony attended by numerous dignitaries, including President Warren G. Harding and his wife, Florence, who may or may not have been named after the city where Dante was born. While most Presidents happily retire back to their home state after leaving office, Woodrow Wilson decided to remain in D.C. In fact, he is the only American President to select D.C. to be his home following his final term in office. 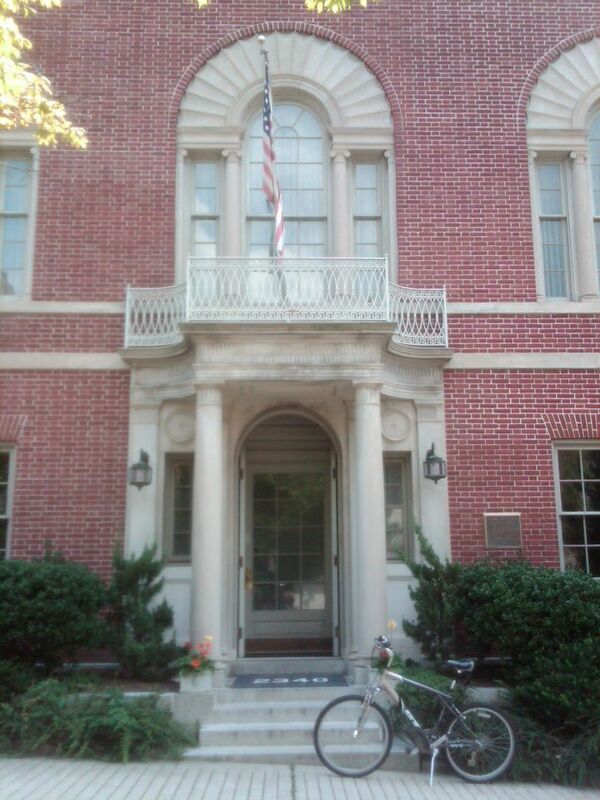 So on a recent bike ride I chose to go by the Woodrow Wilson House in northwest D.C. 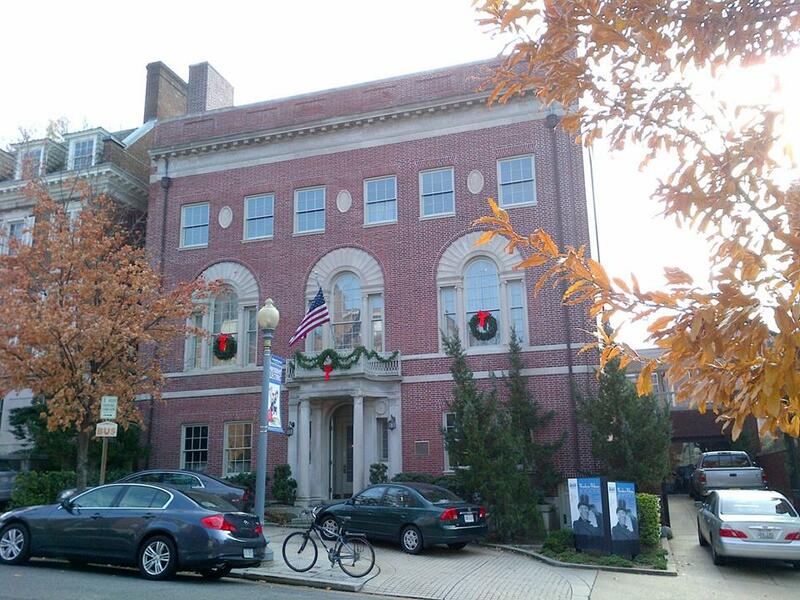 Sometimes referred to as “the other executive mansion,” the house is located at 2340 S Street (MAP) on Embassy Row in the city’s Kalorama Neighborhood. Late in 1920 after leading the nation through the first World War, winning the Nobel Peace Prize, and creating the League of Nations, the 28th President’s second and final term was nearing its end. Needing a place to live after leaving The White House, his wife Edith Bolling Wilson began to search for an appropriate residence. His second wife, she had lived in D.C. before they met and received a small fortune when her former husband, a prosperous local jeweler, passed away. However, her husband made his own plans. On December 14, Wilson insisted that his wife attend a concert. When she returned he presented her with the deed to the Georgian style mansion on S Street. He had bought the house despite having never even seen it. The former President and his wife moved into the home on Inauguration Day in 1921. Wilson, partially paralyzed from a stroke he suffered in 1919, spent his few remaining years in partial seclusion at the house, under the continuous care of his wife and servants. It was from the balcony of this house that Wilson addressed a crowd in November of 1923 as his last public appearance. On February 3, 1924, he died in an upstairs bedroom. He was laid to rest in Washington National Cathedral, becoming not just the only President to remain in D.C. after his presidency, but also the only President to be buried in D.C. Mrs. Wilson continued to live in the residence until her death in 1961. She bequeathed the property and all of its original furnishings to the National Trust for Historic Preservation, which designated it a National Historic Landmark in 1964. The National Trust continues to own the house, and currently operates it as a museum. 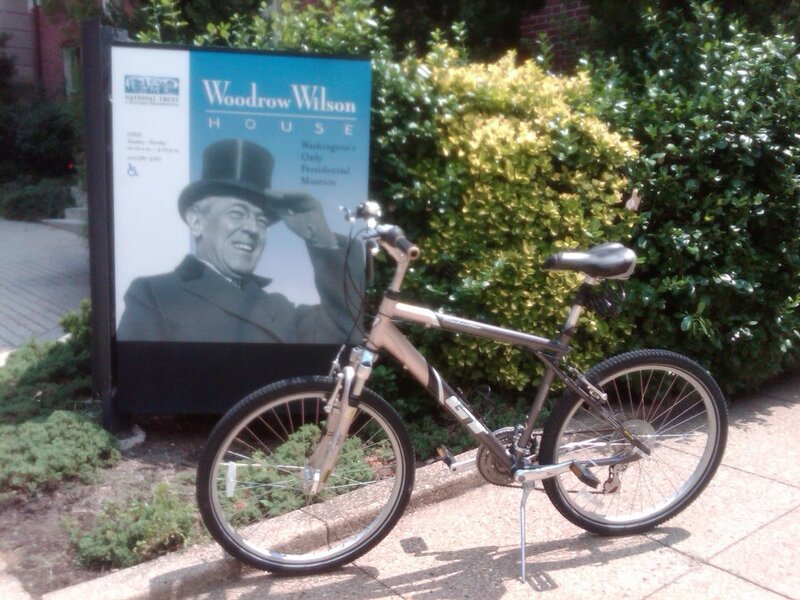 I think President Wilson would have approved of my adventures biking around and exploring D.C. He cycled regularly, including several cycling vacations. However, as President he was unable to bike around D.C. for security reasons. Unable to ride, he took to playing golf with equal enthusiasm. In fact, Wilson holds the record among all U.S. Presidents for the most rounds of golf, having played over 1,000 rounds, or almost one every other day.